A little girl who was killed along with her sister this week in their mother's south-side apartment didn't live long enough to see her first Christmas. 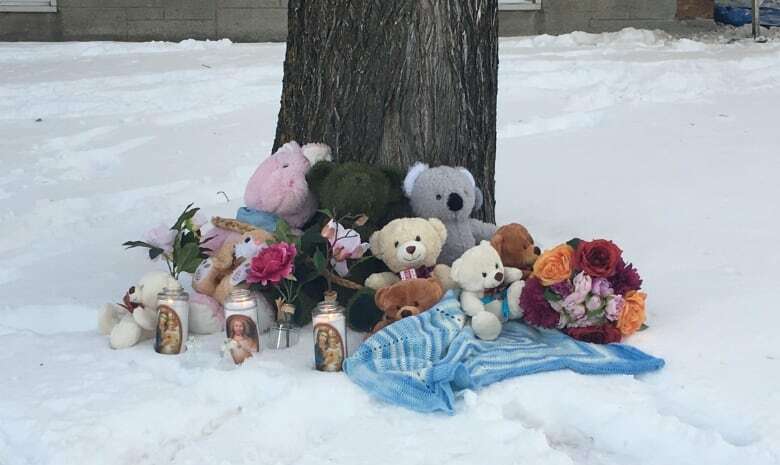 A priest who knows the family told CBC News on Friday that one of the girls was seven months old when she died. Her sister was three years old. 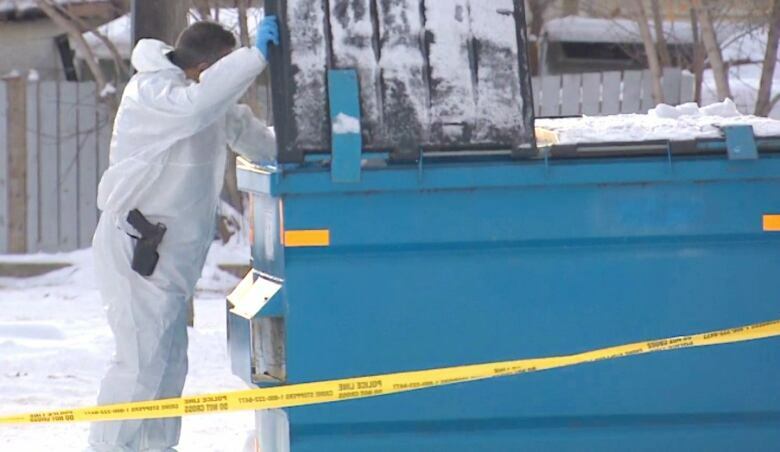 The two dead children were found together Wednesday in a storage room, their bodies covered by what police described "a pile of household items." A 29-year-old man who was the father of the younger girl has been charged with two counts of second-degree murder. Ashton Brian Lafleche has also been charged with assault causing bodily harm against the children's mother. Court documents identify the two children as Mackenzie Petawaysin and Mary Lafleche Petawaysin, and their mother as Tamara Petawaysin. 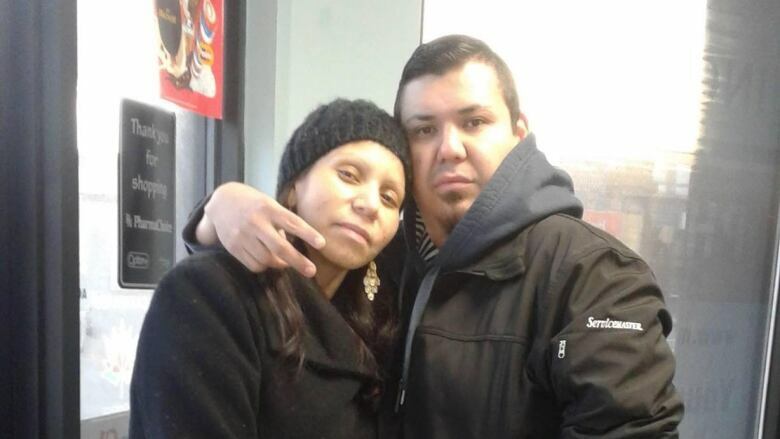 She and Lafleche were in a relationship, police said Friday, but he did not live with her in the apartment where the children's bodies were found. Lafleche pleaded guilty in Stony Plain court on Oct. 31 to assaulting Petawaysin. The assault happened in mid-September. He also pleaded guilty to failing to comply with a probation order, and was fined $200 and placed on probation for 12 months. Under the terms of his probation, Lafleche was ordered to have no contact with Petawaysin. On Nov. 30, after pleading guilty to a breach of recognizance, he was sentenced to 20 days in jail. It's not clear why he was not in jail at the time of the offences. Acting Staff Sgt. Terrie Affolder of the Edmonton police homicide section confirmed the charges at a news conference Friday at police headquarters. She called the deaths "senseless." "Our sincere condolences go out to the family and friends impacted by this tragedy." Autopsies were scheduled for Friday morning. Police said results will most likely be available by Monday. While police did not release the names of the children or their mother, CBC News identified them through court documents. Lafleche appeared briefly in Edmonton provincial court on Friday by closed-circuit TV. The case was put over for two weeks. He is scheduled to be back in court on Dec. 21. The apartment where the bodies were discovered is in Allen Manor at 7920 71st St., in the King Edward Park neighbourhood. Officers were initially called to the area around 5:30 p.m. MT on Wednesday and found a woman in distress who had suffered serious injuries. "Information was that a female was being chased by a male outside, and that she appeared to have been assaulted," Affolder said. After interviewing the woman, police learned the name of a suspect and were told that two children were involved. Officers returned to the woman's rental suite but were unable to locate the children, Affolder said. "In the early stages of the investigation, we did not know where the children were," she said. About three hours later, another call to police reported an "an unclothed male" acting erratically. He had broken into a garage near 73rd Street and 80th Avenue. A woman who spoke to CBC News said she heard someone in her garage on Wednesday and went out to look. The woman, who asked not to be identified, said she encountered a naked man. She described him as catatonic and said he didn't speak, but just stood there looking down. The woman said she gave the man a blanket to cover himself with until police arrived. After questioning the man, police returned to the suite and found the children's bodies around 8:30 p.m. The mother continues to receive treatment in hospital, Affolder said. "She has serious injuries but she will survive." Police are offering counselling and support to the officers who responded to the call. It has been an emotional case, Affolder said. "Investigations involving the senseless death of children create impacts that are felt throughout the community, including some of our officers." Christian Tobar, who lives in Allen Manor, said the children and their family moved into the building about two months ago. He said he often heard arguments, even through the walls. "I heard yelling the night before [the kids were found dead]. The girl was like, 'I'm going to kill you ... get out of my house. Every time, you always do this to me,' and stuff like that," Tobar said. Tobar said police knocked on his door on Wednesday night and informed him of the deaths. Since then, the building has been crawling with police and forensic investigators in hazmat suits. Tobar was disturbed by the news. "I found that out and [I thought] I gotta move out of here, I'll be honest. It makes me sick to my stomach. I have kids myself."